ZAITSEVE, Ukraine -- When artillery shattered the roof of her cottage in this eastern Ukraine village, single mother Nina sought a home that offered more protection from the fighting for herself and her five young children. Displaced Ukrainian single mother Nina poses with her five children after their return from school. "It's probably still not a match for the mortars," she said of the house that the village council helped her to find in this war zone. "But when there is shelling my sister joins us with her kids. We all sit here together, fighting off fear." 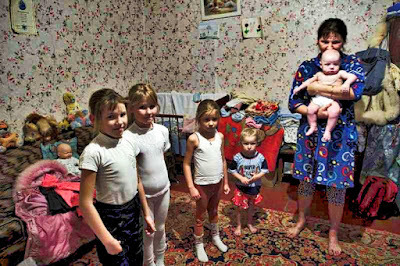 More than two million eastern Ukrainian civilians have been driven from their homes since the beginning of the conflict in 2014. Many like Nina live in limbo, displaced in their own country, where continuing hostilities and the breakdown of services mean that every day life is a struggle. Now, as temperatures drop below zero, an estimated 800,000 people are living in difficult and dangerous conditions on both sides of the frontline, amid continuing hostilities. With the first snow and freezing temperatures, the delivery of winter aid to these remote communities becomes crucial. Three little villages share one school in Zaytseve. Students from the other two villages are transported there by a school bus. During intensive fighting, there was no school, only home study, with all homework assigned by phone. Lyudmyla, the school principal, points to the brand new window panes in the corridor as she talks. "I cannot stomach the memories of the shelling," she says. "Searching for shelter, taking pupils to some place safe. When fighting returned we would immediately dial the school bus driver urging him to take children back to their home villages." This winter, with daylight in short supply, the school bus from Zaytseve will deliver some students to their home village after sunset, around the time when the gun battle resumes. There is no armed convoy for the bus. As the situation continues to deteriorate in eastern Ukraine, many of the people in the areas affected by conflict will remain trapped and isolated this winter. Fighting makes humanitarian access particularly difficult in the so-called 'grey areas' near the frontline where needs are greatest. Since November UNHCR has sent nearly 1,000 metric tons of humanitarian materials and emergency aid for the affected population, with more resources now mobilized for future dispatches in the non-government-controlled territories. Despite the worsening conditions, single mother Nina is grateful for the support she has been receiving so far, as she tries to patch together a life for herself and her children in adverse conditions. "For the kids, I get some state allowance," she says. "But I have to give back the money I owe. If we need to see the doctor, we take a cab to Zaytseve. Once or twice a month we go north to Artemivsk to stock up on groceries, etcetera, also by taxi, for lack of alternative. There is someone here in the village to supply us with milk from their cow. Humanitarian aid is here in supply as well."